Elizabeth and Angie talk about simplicity. How to strip out what isn’t necessary. Why simple motives are more convincing, according to Angie and Matt Bird. What Einstein might have said about simplicity. What Elaine Scarry might have said about reading. Why the 5-whys method from systems analysis can help you understand your characters, their world views, decisions, actions and emotions. And that Dennis Lehane’s Shutter Island brings emotion to the fore. Write to us a @questions@storymakersshow.com or post them on the Story Makers Show page on Facebook or hit reply to this newsletter and ask away! 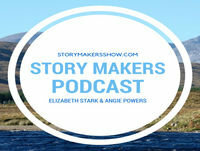 Story Makers is a podcast that features in-depth conversations with accomplished writers, filmmakers and industry experts about story craft, technique, habit and survival–everything you need to know to stay inspired, connect to your creativity, find others’ wonderful stories and your own success. Elizabeth Stark is a published, agented novelist and distributed filmmaker who teaches and mentors writers at BookWritingWorld.com.